Lentil Croquettes recipe by Nazia Nazar at PakiRecipes.com. A flavorful dish that wouldnt let you think of meat for a while. It tastes great when you serve it salad greens. Put the lentils in a large saucepan with the bell pepper, onion , garlic , garam masala, cayenne pepper, ground cumin, lemon juice, and peanuts. Add the water and bring to a boil. Reduce the heat and simmer, stirring occasionally, for about 30 minutes, or until the liquid has been absorbed. Remove the mixture from the heat and leave to cool slightly. Beat in the egg and season to taste with salt and pepper. Leave to cool completely. With floured hands, form the mixture into 8 croquettes of any shape you want. Mix the flour, turmeric , and cayenne pepper together on a small plate. Roll the croquettes in the spiced flour mixture to coat thoroughly. Heat the oil in a large skillet. Add the croquettes, in batches, and fry, turning once, for about 10 minutes, until crisp on both sides. 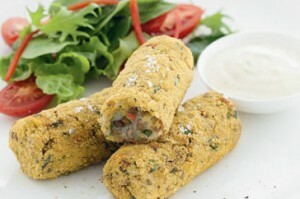 Transfer to warm serving plates and serve the croquettes with crisp salad greens and fresh herbs.